it's Justine and I have a video showing off my new "Craftroom" aka a piece of my bedroom. I am going to do more individualized, close up video on how I organize but this is just a general overview if you are interested! A big thank you to Organize More for helping me find the perfect ink organizers! You must order by November 10th to have them ready by Christmas so get those orders in! I use a mixture of MFT and Avery Elle pockets. They are the same quality and I don't notice any difference. It just depends what I need to stock up on because Avery Elle doesn't have tall pockets and MFT doesn't have extra large. Thanks for the overview, Justine. I may just have to purchase the drawer unit for my mini inks. I'm saving my pennies for the Organize More ink storage. Thanks for sharing your space with us. It was such a great reminder that we don't have to have everything in order to create. Sometimes I feel anxious because there is a stamp or die I really want, but then in a few days I've found something I can use that I already have, and have forgotten about the item I couldn't live without. That looks really nice! Very well organised! Your craft space looks lovely and so well organised. I should adopt the same approach that you use, i.e. purging if I buy more stuff, but I have to confess I am a real hoarder and have trouble letting go. Your space is so neat and tidy, I love it. Those Alex drawers are the best, I have several different sizes and they make organizing a pleasure. I really enjoyed seeing where you create Justine! I recognized one of my cards up there on your shelf :) - you have things organized so well. I had no idea that MFT had tall stamp storage and now I know where to find the right size for my tall stamp sets! Thank you for sharing with us! 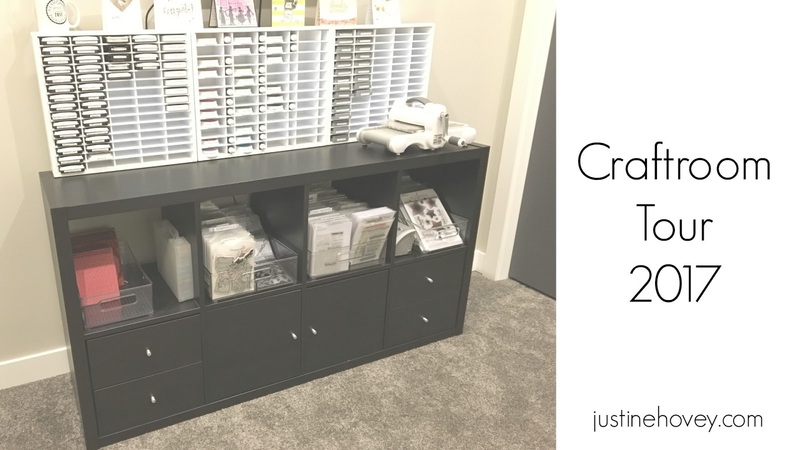 Thanks for sharing your craft space and organizational tips. I really appreciate the fact that you don't have a whole craft room and show how you can make the most of a small space and limited materials. It makes crafting seem much more accessible this way.